Shogun is a great mix of wargame and Eurogame. It is an economic area control strategy with elements of bidding. The game feels a bit like and advanced Risk. 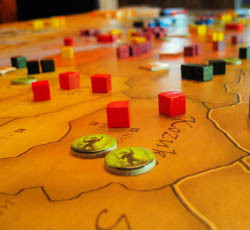 The players attempt to dominate as warlords during the Sengoku Period in feudal Japan by controlling as many provinces as possible. They can also develop their realm by building castles, temples and theaters. If a player maanges to build the most buildings in all the 5 regions, then he will receive bonus points to become the shogun. The game board has two side: one with a sun and one with a moon symbol. On the map, there are 5 regions each contain 9 provinces. The maps differ on either side of the board. Armies are respresented by 310 cubes in 5 different colors (Black, Red, Yellow, Purple and Blue). Twenty green cubes form neutral armies of farmers. A battle twoer is used to conduct battles by the attacking and defending player. Province cards for each province on the two sides of the game board. War Chest cards with values (0-4). Special cards grants unique abilities to the player. Event cards effects all players. Daimyo cards show the player turn order. Players may build 28 castles, 26 temples, and 26 theatres in their provinces to score victory points. The game play is quick and easy. Each turn, you get money to build castles or hire troops to attack your enemies. The fights are ordered from the ranged weapons, bowmen and riflemen, to the 3 daimyo (generals), through the swordsmen and spearmen. It takes a lot of planning to organize your armies and to stand guard in the provinces. Shogun goes on for 2 years and each year has 4 rounds (season). In the 4th season (winter), you can score points. The game can be played by 3-5 players (12+ age) and an average game takes about 2 hours. 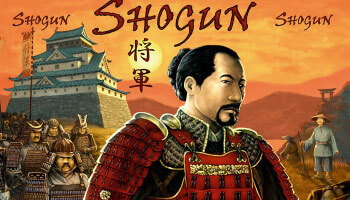 Shogun was created by Dirk Henn and first published in 2006 by Queen Games. The game is based on the game Wallenstein.